Callum and his team answer with the E-Pace. 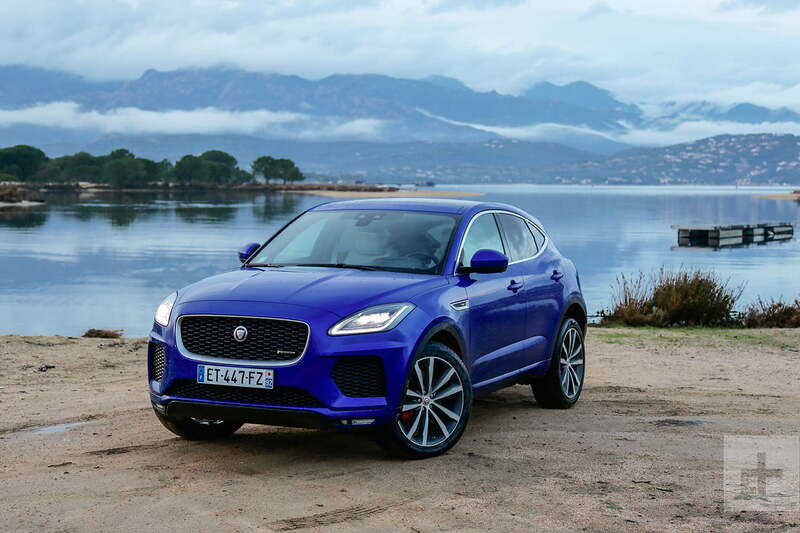 Cute yet fierce (not unlike a Jaguar cub), the E-Pace borrows the right styling cues from its F-Pace and F-Type family members, while introducing its own flourishes. 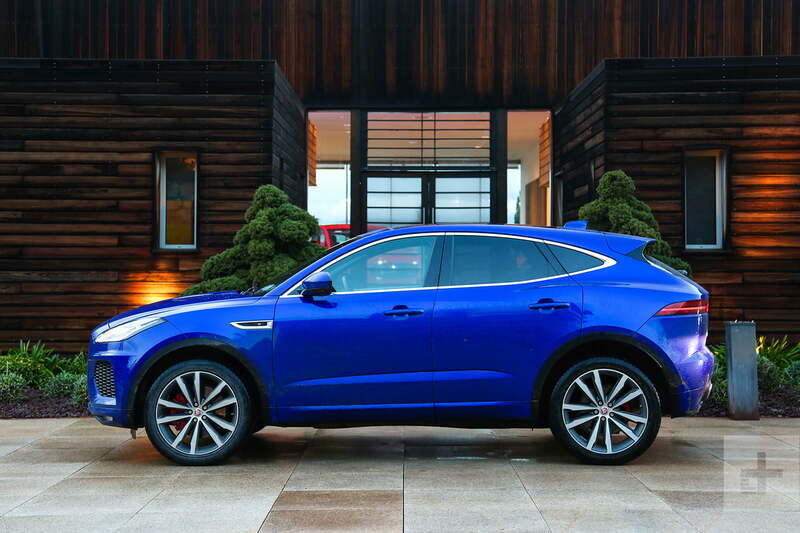 Priced from $38,600, Jaguar’s second SUV, and new entry-point, is breathes life into an accountant-ordained segment. There’s a fair bit of intelligence beneath the E-Pace’s striking design. A standard 10.0-inch Touch Pro infotainment system fills the center stack with stimulating visuals. The system’s tile-based layout, snappy response, and sharp resolution are segment high-points. A 12.3-inch digital driver display, an innovation traditionally reserved for upmarket models, is available in range-topping HSE R-Dynamic trims. Jaguar’s all-new, full-color, heads-up display shows speed limit, navigation, media, and engine data in the driver’s forward view. Two USB ports are standard, and up to five USB connection points are available. A standard InControl app allows users to lock/unlock, set climate control, and check fuel levels via their smartphone. A Wi-Fi hotspot for up to eight devices, 825-watt Meridian 15-speaker sound system, and activity key (a waterproof wristband to lock/unlock the car) are optional upgrades. On the tech front, the E-Pace overwhelms the X1, GLA, and Q3 with sophistication and convenience. 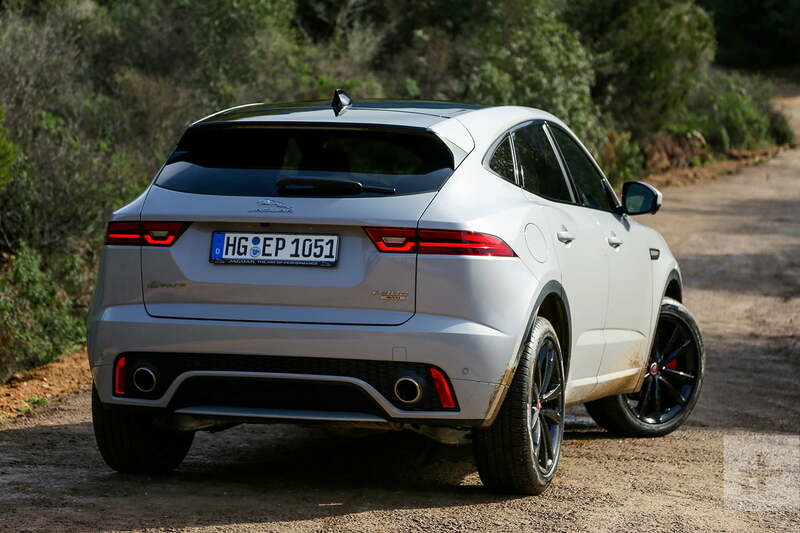 Though its coupe-like silhouette suggests otherwise, the E-Pace is one of the tallest vehicles in its class. Height lends itself to generous headroom for up to five passengers and impressive cargo capacity. However, long-legged rear riders may run into some issues with knee room. With the rear seats in place, the E-Pace boasts 24.2 cubic feet of space – expanding to 52.7 cu. ft. with the seats folded. Only the longer BMW X1 offers more cargo capacity. The E-Pace is no sports car, but it does a fine impression of one when faced with a twisty road. 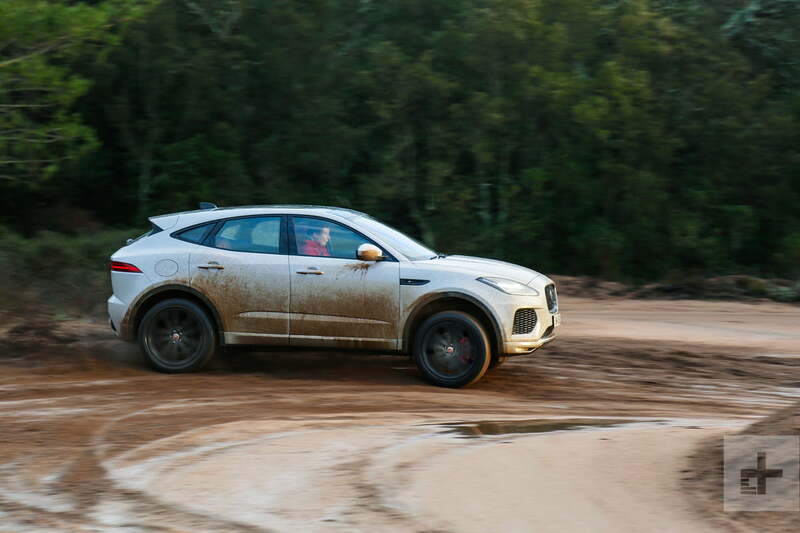 As Jaguar’s first front-drive derived model of its all-new lineup, the E-Pace must conquer the physics of understeer. To do that, the SUV uses an active driveline (standard on R-Dynamic models) to shuttle torque between axles and to each rear wheel. When prodded along Corsica’s narrow, serpentine roads, the brake-based torque vectoring system detects grip (not slip) to apply power effectively. When the road straightens and your pace slows, the E-Pace can power just the front wheels to maximize fuel efficiency. All North American E-Pace models are powered by a 2.0-liter turbocharged four-cylinder and use a new ZF nine-speed automatic transmission. Standard E-Pace SUVs deliver 246 horsepower and 269 pound-feet of torque. R-Dynamic models add 50 hp and 26 lb-ft of torque (the same tune as Jaguar’s F-Type sports car). 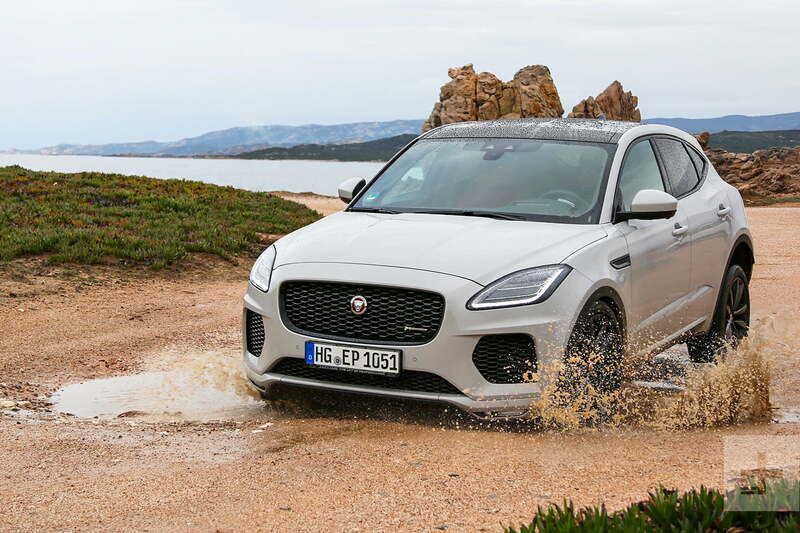 Regardless of tune, the E-Pace is more powerful than its key rivals, the 228-hp X1 xDrive28i, 208-hp GLA250 4Matic, and 200-hp Q3 Quattro. Balancing the scales, however, is the E-Pace’s trailing mpg ratings. At 28 highway, 21 city, and 24 combined for P250 models (27/21/23 for P300 versions), the E-Pace is down 1 mpg to the X1 and 2 mpg to the GLA in combined ratings. Only the Q3 is less efficient. Jaguar says the sweet spot for most E-Pace sales will fall into the $45-$50K range, which aligns with our preferred configuration. The R-Dynamic’s active driveline and potent engine tune is exciting, but permanent all-wheel drive, a robust 246hp, and one extra combined mpg are plenty appealing. For this reason, we’d choose the standard (P250) configuration at the SE trim level ($44,300). Included in this spec is the full driver assistance suite, 380-Watt Meridian sound system, 19-inch wheels, grained leather seats, and Wi-Fi hotspot. On top of this, we’d add the black exterior package ($220), 19-inch dark gray diamond turned wheels ($610), panoramic sunroof ($1,225), keyless entry ($565), 12.3-inch digital driver monitor ($565), head-up display ($970), and surround view camera ($360). Wrap all this in the Borasco Gray paint with a red leather interior. Final total? $48,715 (plus $995 in destination and handling). The German luxury brands make cookie-cutter SUVs; Jaguar sets the mold.